An interesting experiment with connecting vessels.The apparatus is an ideal experiment platform to study the principles of connecting fluid vessels. It consists of a set of 4 intercommunicating glass tubes of different diameters and shapes. 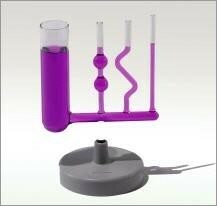 This is an ideal demonstration tool for the observation of fluid dynamics. Weiterführende Links zu "Altay Communicating Vessels"
Kundenbewertungen für "Altay Communicating Vessels"